Rules state that you have to upload pictures, or links to pictures. The latter may be easier for a lot of people. You can use services like Photobucket or Imgur (there are many others) and just post links here. It is easy and your image files can be quite large. However you can also upload pictures to your For Sale post that people can see without having to follow links. Above the text box where you normally compose your messages, find the button with an arrow pointing to about one o'clock. Click on that. The page will quickly reload and you will see a bunch of new buttons above the text box. A lot of them are formatting buttons. However, in the top row you will see a button with a tree on it. That is the image upload button. Click on that. A new dialog box will open. On the LEFT SIDE there is a button that says Browse. Clocking on that allows you to search your computer for image files to upload. Click on the desired image file and then hit the button that says Upload. If the image file is not too large, it will upload to the MyTT site. You will then see the file name in the box above those two buttons. Now click on the file name in that box and the image will appear in the box on the RIGHT side. You can hit Preview if you want an advance look. If you are satisfied, just hit the button marked OK, otherwise hit CANCEL button. What can go wrong? Pretty much only one thing in my experience: If your image file is too large, you will get a message when you try to upload. You will need to use some other software to shrink the image. There are many of those. Using Chrome on an Android machine. Almost the same except that after the first step (clicking on the arrow pointing to one o'clock) you get a slightly different set of buttons. Click on the one the button with a tree and an arrow (both). After that it is just like described above. After the arrow can use other buttons to upload youtube videos, links to websites etc. For example the button that has something that looks like film allows you to upload youtube. An important point there is that even if the original website on the web has an address that starts with https:// make sure to remove the "s" or it confuses the site. Also, if you are using the first option above, in which you are posting a link to your image, you might want to go ahead and use our "Insert Hyperlink" function. That is the button that likes like the earth sitting on top of a figure 8 or something. Click that and a dialog box opens and you can insert your link. It is pretty straightforward. The advantage of that is potential buyers can click on the hyperlink from your post and get directed straight to your picture files. That means they don't have to cut and paste from your advertisement to their browser and therefore they are more likely to buy your stuff (since cutting and pasting is a real pain if people are using a cell phone or tablet). Here is what you see after you click the one o'clock arrow. There is also an emoji button on the top. It has no advantages to the set of emojis to the left of the composing box. 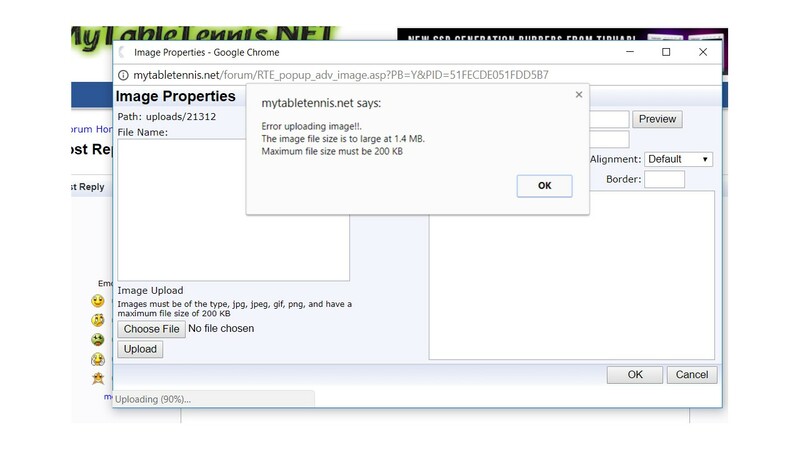 In my previous message, in the dialog box to the left you will see a list of image files that I have previously uploaded to MyTT. To insert one of them into a thread, I just click on one then hit the OK button below the box on the right. After you hit OK you are returned to the Form box where you are composing your message. You can type above and below the image. It is usually best to write some of your text before inserting the image. Finally, here is a search I ran to give lots of results of ways to make jpg files smaller if they are too large. There are a bazillion ways to do it, and there is really no excuse for not posting images on your for sale threads. I may give you a day or two of grace time if I find a thread without photos. After that, zap!